In December 2016, Mike and I adopted our best buddy, Lando. After just a few weeks of endurance training, Lando went from sitting down as soon as my watch struck mile 5 to trotting next to me for up to 10 miles straight. On the flip side, after just a few weeks of him speed training me (! ), I've run three races averaging 6:15 min/miles or faster. He has kept me motivated and definitely kept my runs interesting! 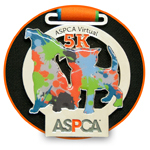 To honor my running buddy and to encourage others to adopt a furry running (or walking) buddy of their own, Lando and I will be participating in the inaugural ASPCA Virtual 5K. Part of the ASPCA's work involves placing animals like Lando, a former stray, into happy and healthy homes. Please support me and Lando by making a donation to help positively impact in the lives of animals. Thank you!